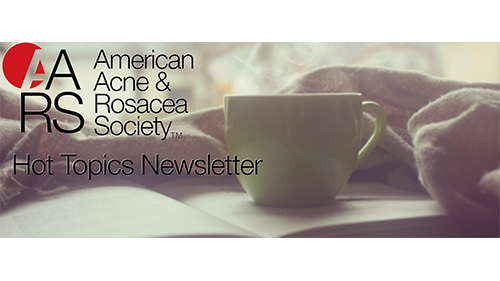 The AARS online Hot Topics Newsletter is an exclusive AARS member benefit! This is a semi-monthly compilation of peer-review literature and online updates in acne and rosacea covering industry press, new medical research and what patients and your peers are talking about in patient counseling tips. Dermira completes patient enrollment in two phase 3 pivotal trials of olumacostat glasaretil for the treatment of acne vulgaris. Intense pulsed light treatment for patients with hidradenitis suppurativa: beware treatment with resorcinol. Fractional carbon dioxide laser for the treatment of facial atrophic acne scars: prospective clinical trial with short and long-term evaluation. Treatment of acne scarring with a novel fractionated, dual-wavelength, picosecond-domain laser incorporating a novel holographic beam-splitter. Pulsed dye laser treatment combined with oral minocycline reduces recurrence rate of rosacea. Comparative effects of schisandrin A, B, and C on Propionibacterium acnes-induced, NLRP3 inflammasome activation-mediated IL-1β secretion and pyroptosis. The person-centered acne severity scale study. Hidradenitis suppurativa is associated with myocardial infarction, but not stroke or peripheral arterial disease of lower extremities. Uncovering burden disparity: A comparative analysis of the impact of moderate-to-severe psoriasis and hidradenitis suppurativa. Role of demodex mite infestation in rosacea: A systematic review and meta-analysis. The burden of illness of erythematotelangiectatic rosacea and papulopustular rosacea: findings from a web-based survey. Treatment of moderate-to-severe acne vulgaris in a Hispanic population: A post-hoc analysis of the efficacy and tolerability of clindamycin 1.2%/ benzoyl peroxide 3.75% gel. Nonablative fractional laser resurfacing in skin of color: evidence-based review. Living with acne: belief and perception in a sample of Indian youths.